Salam & hello everyone! How are you guys doing? Here is another Ms Rosy series especially for you! Well, I am not gonna keep it to my self for something good, especially when Ms Rosy tell me some beauty secrets right! Hehe... 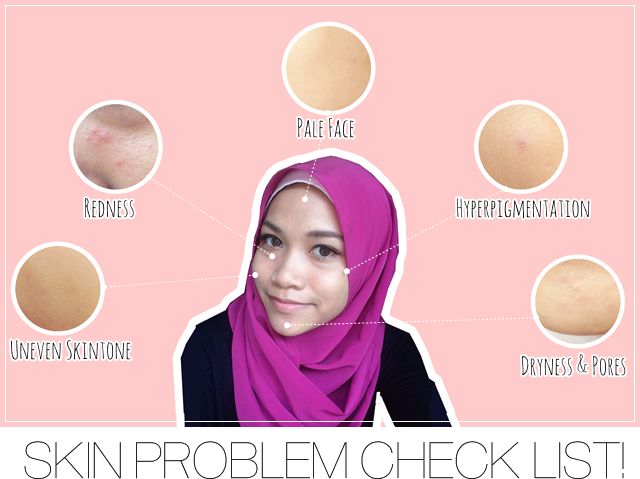 So let me show you how to choose the right skincare when you have my kind of problem. As you can see above (again, total bare face except for brow pencil and color lens), these are my skin problem. Well, I can wear filter when I am in the real world unless I paste a filter picture of me on my face can I? Haha! I am as normal as you guys, I also experience lack of sleep, time and care to my skin. So I need something simple and fast! Uneven skin tone. As a hijab girl like me, I tend to be exposed to the sunlight everyday with my hijab on right. So the area that are protected on the inside of my hijab aren't that exposed to the sunlight cause uneven skin tone. Kinda like a tan line to my case. So in this case, pretty funny looking skin I have on my face right. Same goes to you girls out there that may have fringe on your forehead that causes situations like this. During the day UV Rays will cause causing flat brown lesions to your skin. So you need a protection to decrease the chances your skin to turn darker than it should be. So I need a moisturizer that protects my skin during the day as well as treatment of whitening to my skin. That will be the White Perfect Day Cream with SPF 17++ that helps to protect skin from UVA and UVB. ! It contains a Melanin Vanish™ that is 50X more powerful, which helps to inhibit melanin production at the source. Pale Face. Pale face make you look sick. I always get this kinda impression of, "Are you sick?" while I am not. Even during work time back in the years ago, people always said I have pale face. My skin is not fair, because I am more of a olive/yellow skin tone. My face always make me look sick if i don't wear foundation. With the help of L'Oreal White Perfect Range, that contains Tourmaline Gemstone that helps to make your skin fairer with that hint of a healthy skin of rosy finish! With a high concentration 50 times more powerful even in one drop, L'Oreal White Perfect Double Essences got it! Hyper-pigmentation. It can also categorize for that dark spot you get after popping your acne! . A big NO NO actually but I just can't help myself. Also its a build up of Melanin. To help reduce dark spot like these you need a lots of good stuff like Vitamin C, and skin ingredient agents that helps to remove the "dead skin/scars that have been build up in your skin. So no worries! This is just for you! This whole set of L'Oreal White Perfect Range contains Tourmaline Gemstone, that one drop acts 50X more powerful than before and Vitamin C that helps fight against Melanin production! 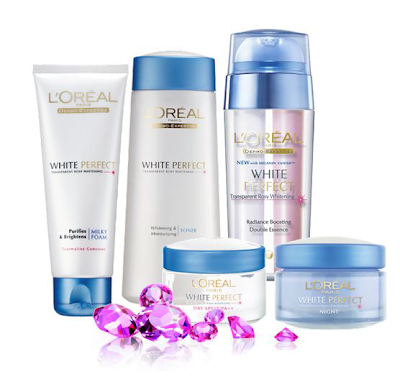 Especialy the star product which contains lots of these benefits are the L'Oreal White Perfect Day Cream SPF 17++ , L'Oreal White Perfect Night Cream and L'Oreal White Perfect Double Essences! Awesome! Dryness & Pores. Pores sometimes cause by dryness where your skin becomes flaky and rough due to lack of sleep as well of dehydration. Being a bus girl like me, I always forgot to take up my at least 8 glass of water. Poor me. With the help of a every night treatment, L'Oreal White Perfect Night Cream truly a saver! After using all the range of White Perfect, I applied this last before sleep. In the morning, it really makes my skin supple and hydrated! I really love this Night Cream! Its alike a overnight treatment! Hydrating and helps my skin look rosy fair! What could I ask more! Now that is how Ms Rosy revel her secret to Rosy Fairness to my skin problem! sab ur skin just nice.cume masalah sikit2 je its normal.sab can u suggest me the best mask and foudation for type skin like i ni.jenis combination skin.